To start with let us understand what these OLED displays mean. The term OLED stands for “Organic Light emitting diode” it uses the same technology that is used in most of our televisions but has fewer pixels compared to them. It is real fun to have these cool looking display modules to be interfaced with the Microcontrollers since it will make our projects look cool. Before you start working with your OLED display make sure under which category your display fall into. Here we have shown a Monochrome 7-pin SSD1306 0.96” OLED display. This type of display can work on three different communications Protocols such as the SPI 3 Wire mode, SPI four wire mode and IIC mode. SPI 4-wire mode is the fastest mode of communication and the default one. As said earlier the module we are using will have 7-pins, the picture of the same is shown below. There are lots of vendor for these modules and hence your board might look slightly different than mine. Also the naming might also be differed. The pins and its functions are explained in the table below. The above shown module can operate in all three modes. When you purchase one, your module will be set to work in 4-Wire SPI mode by default. You can change it to work in I2C or 3-Wire SPI by changing the position of the Resistors as shown in the Bottom Layer silkscreen of the board. 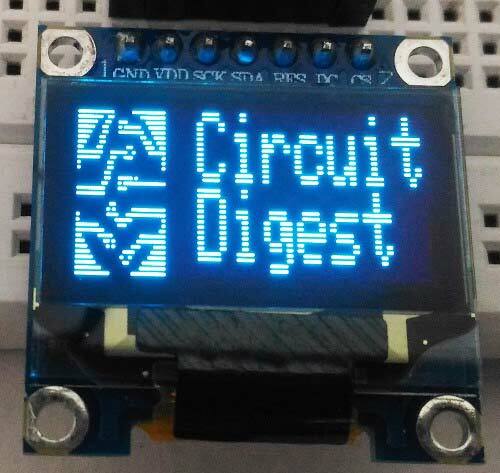 In order to make something appear on the OLED screen we communicate with the SSD1306 IC present in the OLED module. This SSD1306IC will then update each pixel present on our OLED display. This communication can happen via IIC or SPI from any Microcontrollers like Arduino, PIC, etc. In order to communicate with an IC through any of the communication protocol we should first understand the IC by reading its datasheet which is a tiring but useful method. Here we have interfaced OLED with Arduino. Have you connected to d1 mini or nodemcu u with 0.96 in or 0.66 oled shield? If not can you steer me to sites that do? How about i2c 4 pin displays?